Trying new foods and exploring restaurants off the beaten path are an essential part of traveling to new countries. However, traveling with picky eaters and restrictive diets does not always make exploring a country easily done. In China, I experienced a rollercoaster of success in finding dishes to enjoy with my vegan friend. Shanghai and Beijing were a bit of a struggle. There was a major language barrier that left restaurant owners confused. My friend often received dishes with fish incorporated, as chefs assumed she were just asking for no meat. Also being near tourist attractions, there were few trendy restaurants. Most served only average version of Chinese dishes. My friend survived off of plain rice and family mart snacks. Hong Kong, however, was quite the opposite. There were arrays of new restaurants catering to new health trends and veganism. At a newly opened “health cafe” for breakfast, I enjoyed avocado with sunflower seeds, scrambled egg whites, and cracked black pepper over a perfectly toasted piece of gluten free bread with a side of a fruit. My vegan friend got a coconut accai bowl with fruit and granola. We both got soy lattes and split a “green machine” juice, a mixture of fruits and spinach. The meal was perfect way to start a full day after a long night. After exploring some local shops and hiking up to look out over the breath taking view of Hong Kong from Victoria’s peak, we were hungry for a late afternoon lunch. We went to a vegan restaurant called Mona. This place was entirely vegan and, even as a meat and dairy lover, one of my favorite meals of the trip so far. We all got a variety of flat bread wraps with sides to split. I had a wrap with hummus, roasted cauliflower, sprouts and avocado. I also had the side of cauliflower soup and roasted yam fries with “garlicnaise” sauce. The yams were the brightest purple and full of flavor with a light crunch. The soup, although vegan, tasted extremely creamy while remaining light. The meal was a perfect re-energizer. 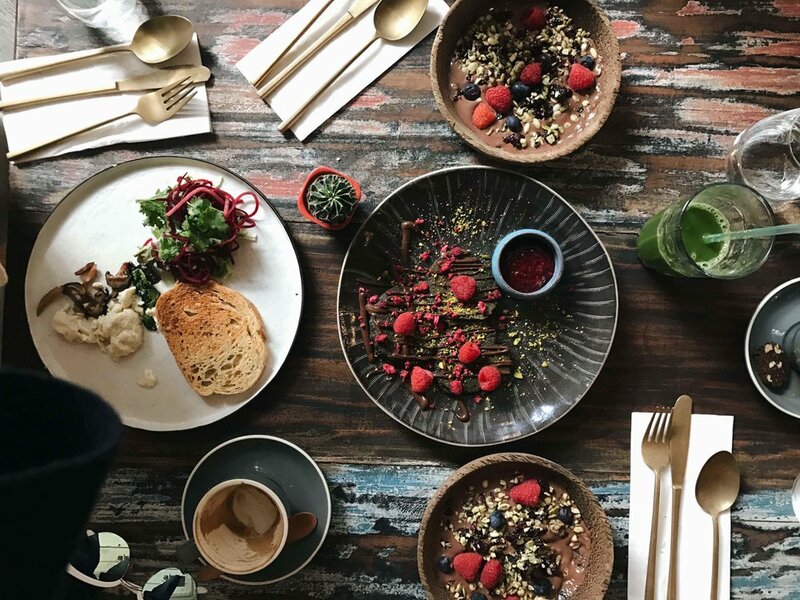 As a person with no dietary restrictions, it can become frustrating to be on the search for a restaurant that can meet the needs of every customer. However, traveling with vegans helps me stay mindful of my eating habits impact on our planet and my health. How does traveling change the way you eat? Local Food. Long fingers with nails and greasy skin boiled in a brown sauce. Why would you eat that? Especially the act of eating is somehow complicated. Gnawing the skin from the little bones feels like eating little spare ribs. I heard it is easier to put the entire finger in your mouth to get the meat. The delicacy chicken feet can be found in many places in China. This experience made me focusing on eating more plant based food such as tofu. In comparison to Japan it is easier to find vegetarian food. 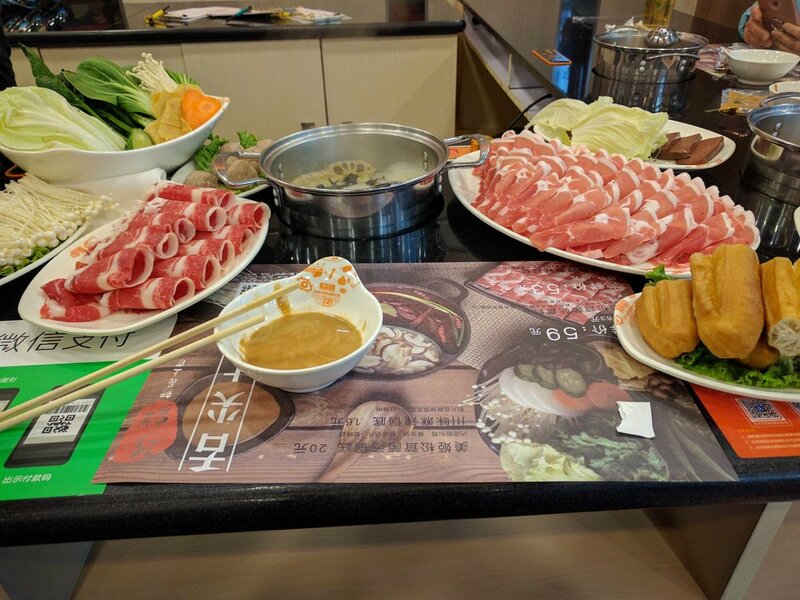 You could go for a hotpot where you put selected ingredients into the boiling water to eat them with a good sauce. Also plain noodle soup with mushrooms where very tasty. I could totally recommend eating the local vegetarian food. Especially when you could experience this in a calm atmosphere with some freshly brewed black tea. In contrast to the local food you can encounter many imported food in a big city like shanghai. In the French concession for example I had the best Indian food in my life. The area itself is famous for its good food. I also had encountered a place where people stand in line with cold temperatures to get ice cream. With freshly made waffles and sorts like salted caramel why not? What astonished me was the fact that they even imported milk from the European Union to prepare their milk tea. Speaking of milk based products: Hägen Daaz ice cream for example is a very luxurious brand there and is present in many places. It seems to be that the food safety is attracting many Chinese people even when this means that a lot of the things they import are expired. Do you experience such a clash of foreign and local food in your country? If you love pork, chicken, sweet and sour flavors and bok choy you will love Chinese food! I’ve experienced some wonderful meals as well as cocktails and tea in Shanghai, Beijing, and Guilin that I cannot wait to share with you. While in Shanghai I visited The Peninsula and The Ritz Carlton. Although the price was very high, the drinks and the view made it worth it. As seen in the picture, the drink I ordered at the Ritz Carlton was called the “Dragon Flower” and it was a beverage made up of different floral flavored juices combined with gin and topped with an edible sugar coated flower. It was delicious and the sweet floral taste took away from the bitter taste of the gin. A lot of the meals I had were at round tables that often consisted of rice, chicken, pork, vegetables, and always ended with watermelon for dessert. One meal that stood out to me was at “The Roasted Duck” where I enjoyed duck wrapped in a thin pancake topped with a sweet soy sauce and green onion. Served alongside the duck was seaweed salad, vegetables, and a peanut glazed cabbage salad. Another surprisingly outstanding meal was actually on my flight from Guilin to Beijing. When you think of airplane food I’m sure tasteful doesn’t come to your mind. The first class meal provided on this flight started with roasted nuts and red wine. The main dish was a variety including delicious pork buns, kimchi topped with a fried egg, and a wide selection of Chinese fruit. One thing China is famous for is their wonderful different types of tea. I visited “The Tea Temple” in old town Beijing where we had a tea tasting. Each different tea had different benefits for the body. The rose tea featured in the photo is said to help with memory and digestion. The wide variety of flavors in each different region in China made it for a very exciting trip full of new foods and exciting tastes! I played it rather safe when it came to the food to eat in China, after learning about the chicken feet, insects, and cow tongue. The most adventurous our meals came to were the roasted duck. 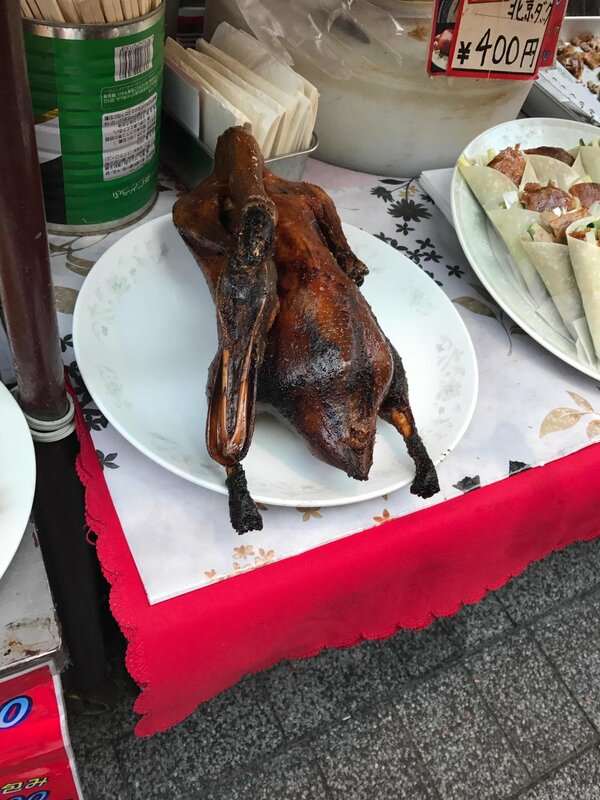 Beijing’s signature dish is the roasted duck, which at traditional restaurants is brought out, beak and all and carved in front of the table. It did not taste or appear similar to the duck often on menus in America. The famous dish was sliced into little pieces of mostly skin and very little meat. They served it with plum sauce, onions and thin pancakes similar to crepes, to be wrapped up and eaten. The plum sauce with the pancake added a sweet flavor to the roasted duck, an unlikely pair that went very well together. The expected dishes such as sweet and sour pork, soup dumplings, spring rolls, and bok choy were served at most meals and all were delicious. But a dish that I have yet to see on a menu at an American-Chinese restaurant is fried red snapper in chili sauce. The entire fish was served on the plate with the meat fried into bites poking out through the bones. It had a crunchy coating and a spicy yet sweet flavored sauce over top. The unusual appearance deterred many but it was worth a taste. I have yet to find a dish such as this anywhere but in China and it deserves recognition for its unique display and wonderful flavor. I hope to try more unusual dishes upon my next visit to the country outside of the westernized cuisine. Where I come from, the Chinese like two things: to eat large quantities of food and to talk about the large quantities of food they've eaten. 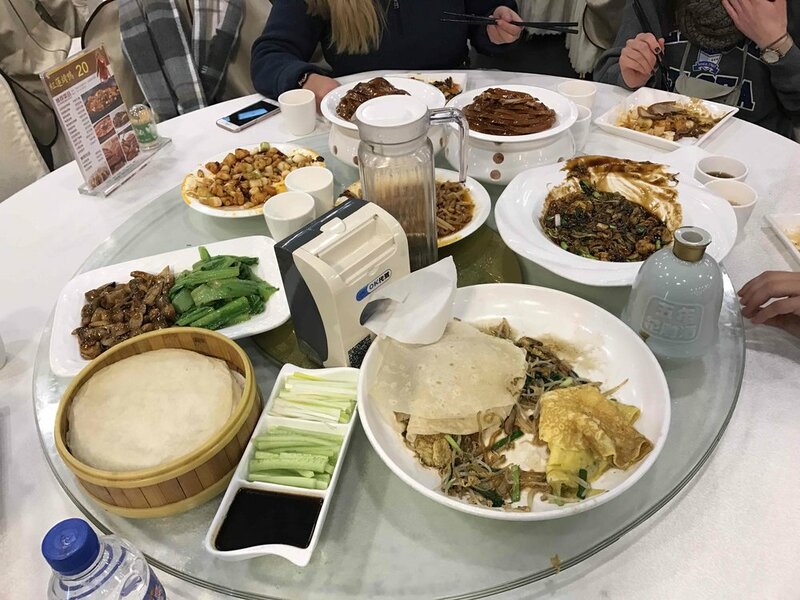 Whilst in China, I felt that it was my duty as a traveler to partake in this culture and to, therefore, order enough food for my friends and the city of Beijing to eat. We were hungry and cold but the amount of food told a different story; it suggested that we had been in war for months and that this was the first food we had seen in ages. 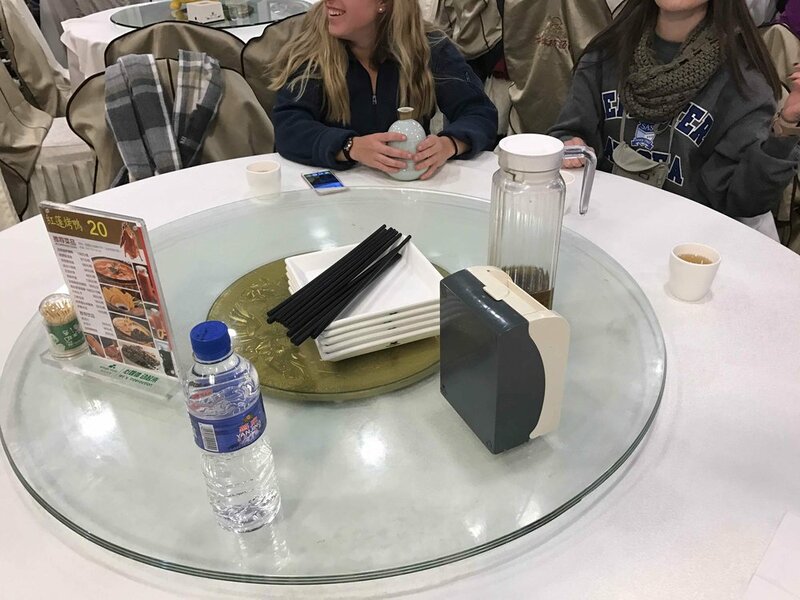 I probably should have known that we were asking for too much when the waitress had to ask me in both Chinese and English if were done ordering… halfway through the order. I threw caution to the wind and proceeded to order every item on at least three pages of the menu. It was safe to say that I was excited and extremely nervous for the bill. Anyways, back to our order! The first few plates of food came out and everything was hot and delicious. The pork tasted fresh and flavourful, the buns were steamed beautifully, the duck was divine, and the sweet and sour pork stole the show. Quickly, however, our food began to catch up with us! We needed to stack dishes on top of others to fit them onto the spinning circle. The dishes jutted out so far that every time we spun the table, it would knock into our plates, cutlery, and cups.